Pioneers in the industry, we offer anti collision device from India. The EOT Crane Anti collision sensor system is a safety device to avoid to collision of two electric overhead travelling cranes working on the same rails. 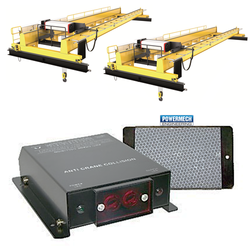 For one pair of cranes one sets of anti-collision systems are required as shown in picture. Each set consists of an Emitter/sensor module and a Reflector. Anti collision sensor device works on the principle of retro reflective infrared waves. It consists of an emitter and sensor module and special reflector. The emitter emits the infrared waves in the direction of the reflector. The reflector reflects these infrared waves back to the sensor. The sensor senses the presence of these reflected infrared waves and activities an alarm single and stops/ reduce the speed of the cranes. Thus if the two cranes are away from each other then the reflected waves will not reach the sensor and the cranes operate normally. The sensing distance is adjustable between 0-3 to 0-10 and 0-20mtr meters. The anti collision system is specially designed for the crane application and is suitable for the continuous duty. Looking for Anti Collision Device ?